Max Squared - The BIG ring for the BIG commitment. This is the age of the new man. And his love for her is bigger and his sense of fashion is bolder, so his expression of commitment should relay a feeling of great depth. Every ring in The Max Squared Collection represents the passion of a man who shouts "I know who I am" from the highest of all mountain tops. Many of today's mass market wedding bands leave a man understating his BIG commitment to the BIGGEST love in his life. Max Squared bands make that brave statement. They are the ultimate merger of Novell's master craftsmanship to a man's depth of commitment. Available in platinum, palladium or gold, Max Squared rings are wider and thicker than the average wedding band style. Novell superior manufacturing insures that the new man can get his new ring almost any way that he wants it, and by nearly any deadline. After all, the new man never settles. He is in command of his expressions, and of his destiny, in life, love and happiness. When you realize that the ultimate relationship requires maximum commitment, you are the new man. You are daring and adventurous. 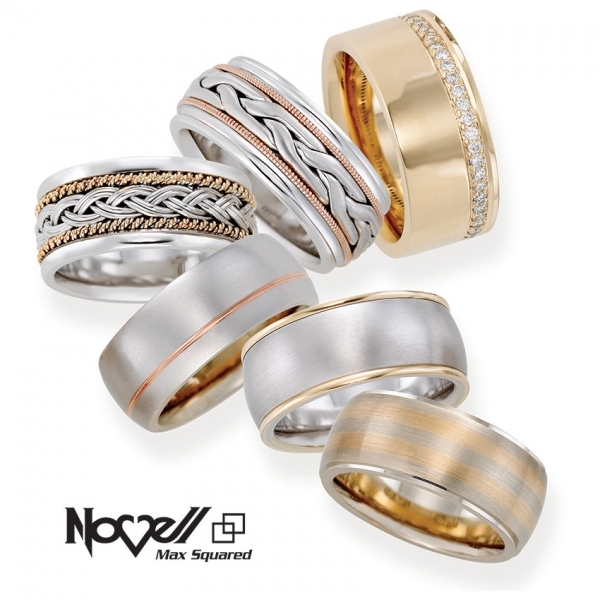 For you, Novell is proud to present The Max Squared Collection of wedding bands. After all, in this case, size does matter. The Max Squared Collection - for the new man to make the boldest statements.